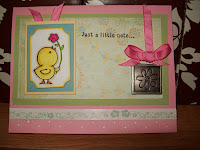 I love this layout from Lauren Meadow's blog http://laurenm.blogs.splitcoaststampers.com/. I tried linking to the Lizzie Ann Designs to post this there, but had no luck. 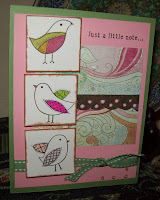 The little birds are from Hero Arts Decorative Birds IV set stamped on Papertrey's White and colored with Copics. The dp is from Basic Grey's Phoebe collection. I used 3-D paint to accent the strip in the middle and the lower corner. I really like the way this one turned out -- I hope you like it, too. 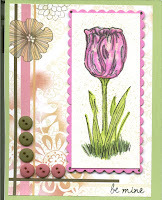 This little card is a vision for Springs coming!! The image is from Stempendous "Hello Chick". 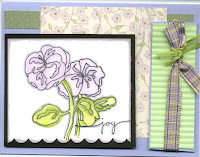 The small medallion is from Making Memories Flowers Charmed Plaques. The background paper is some that my daughter gave me and went perfectly with the SU cardstock (Regal Rose, Certainly Celery, Barely Banana, and Baja Breeze. I don't know if you can tell from the photo, but there is a punched strip of vellum that I decorated with White Gel Pen in the spaces and topped it with a strip of decorative border from a long time ago. I hope you like this little card. I received Starbucks coffee as a Christmas gift and enjoy making a pot on the weekends. I like to put a teaspoon of International's Swiss Mocha in it along with Splenda and a little Coffeemate. Yummm -- it gives me the little "kick" that keeps me going until lunch. These stamps were a gift from a friend and I have never used them until now. 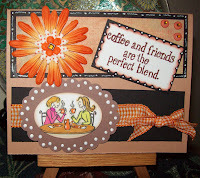 I really like the way the card turned out with the coffee colors accented with the orange. I hope it give you a little "pick me up", too. Come back and visit again!! I wanted to put together a bright cheery card and thought I'd use this "Spring Air" image from Penny Black of a hedgie as the prime ingredient. The Balloons stamp from Whipper Snapper seemed to be the object of the little hedgie's interest. I used some Crystal Effects on the balloons and adhered them on double dimensionals to raise them up off the card higher than the little hedgie. 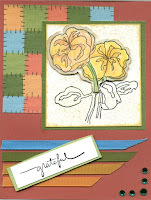 I used Rob & Bob Studio's dimensional stickers to add more interest to the card. 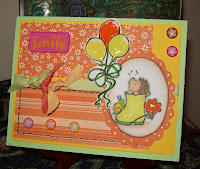 The polytwill ribbons from Taylored Expressions were "taylor" made for the colors on the card (SU's Pumpkin Pie Prints dp, Yoyo Yellow, Glorious Green). Thank you for stopping by and I hope you enjoy the card and that it may help brighten your day! 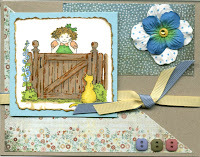 I have loved this stamp (Daisy Canopy from Elzybells) ever since I first saw it!! It is so bright and cheery. I stamped it out twice and colored it with my Copics. I then cut out the daisy and the egg and put them up on dimensionals. The little fence is from AMuse along with the little sentiment "to one of my favorite peeps". The decorative paper is s left over piece that my daughter gave me. I combined it with the One Orange and Certainly Celery all mounted on Barely Banana. 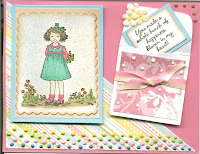 The ribbon is from American Crafts and the colors in the polka dots are truly a match to those in the card. I added the little pearls and used tiny beads and glitter pens from Spica to "jazz up" the decorative paper at the bottom. I think this turned out as a cute card to brighten someone's day! Thank you for stopping by and come back again. Before putting this set back on the shelf, I wanted to do one more using the lily image. Thanks to daughter, Susan, I have layered, layered, layered this one, too!! Colored the image with my Copics using the blender pen to do the "magic" on the flower and the leaves. The dotted dp paper was a gift from Susan, so I tried to put it to good use on this card. I added the doodling along the edges of the green to add a bit of accent to it. I hope you like it as I think it turned rather nice. 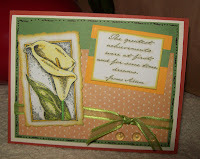 I hope my granddaughter, Lillian (Lily), likes this card in her namesake! Come back again, real soon! I had this Ageless Adornment set from Stampin Up way up high on one of my stamp shelves and had to move it to get to a Valentine set. I left it out as I was inspired to use these colors that I had seen on an HGTV Devine Design show (soft blues and browns). I made a card that was a little "flat". Although I liked the theme and the colors, it needed something, so I took it over to my daughter (susiestampsalot) and asked for her recommendations on making it better. The refinements she suggested worked out wonderful. LAYERS - LAYERS - LAYERS! I have to remember that!! Thank you Susie -- you're an inspiration to us. 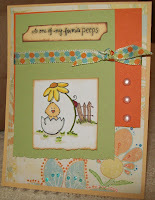 Check out her blog here http://www.susiestampsalot.blogspot.com/ to see what I'm talking about!! 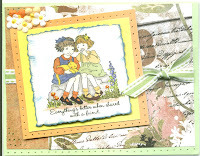 Sometime back, SU created this stamp set called "And Everything Nice". I just could not resist these little girls and have had them on the shelf ready to ink up and color whenever I feel in a "colorful" mood. Well, that's just what happend this week-end! 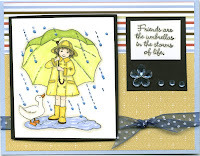 There are four images in the set along with some sentiments and I used all four images on these cards. They are so adorable and you can customize the gals' hair to go wtih either the giver of the card of the receipient(s) of the card. Which one is your favorite? I hope you like them!! A birthday celebration for Susan!! This last Saturday, I had all three of my daughters (Susan aka susiestampsalot, Sara aka Tweaks & Designs, and Nancy aka "her blog is under construction") over to my house to have a birthday lunch and cake for Susan's birthday (I won't say which one, but I will say that I've known her about 42 years now). We had a wonderful "healthy" lunch and then had a Lemon Torte cake. The rest of the afternoon was spent talking, laughing, stamping, and watching little Edison, Sara's 18 month old (he's a real pip and made us all laugh a lot). Susan brought a couple of stamps that were sent to her from their designer (Nancy) and marketed by Cornish Heritage Farms. What lovely subject matter they are!! I stamped some of the images out and spent the rest of the evening coloring and putting them on cards. I enjoyed working with them and am pleased with the way they turned out!! Thank you for visiting my blog and come back again real soon! !